It's really been too long. Again. But hopefully these pancakes will make up for it! 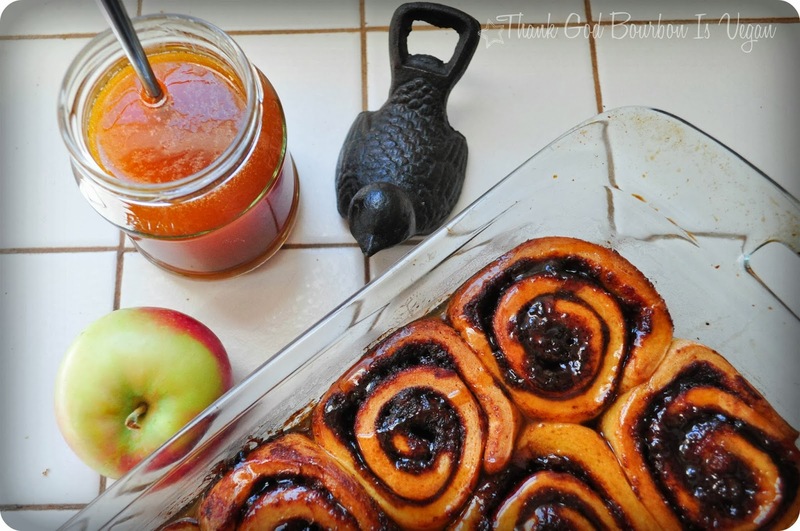 They're perfect for any cloudy fall Sunday morning, but also would be great to make for family over Thanksgiving. Just remember to double or triple the recipe depending on how many people you are making it for and how hungry they are! The recipe is a modified version of my regular pancake recipe. 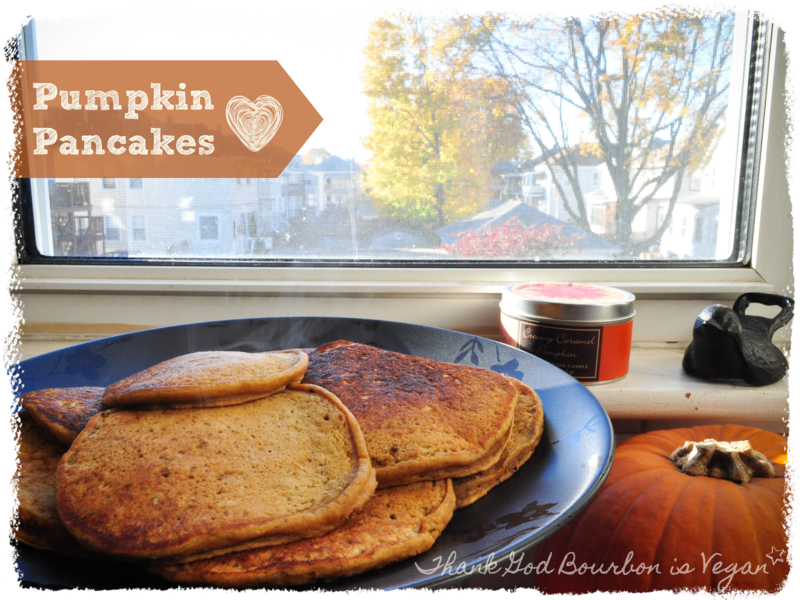 Note that because of the sugar content of these pancakes (I guess from the pumpkin and brown sugar?) they tend to go from golden to burnt very quickly, so keep a close watch on them when cooking. Heat a griddle or frying pan over medium heat. In a large bowl mix together the flours, baking powder, salt, brown sugar, and spices. In a measuring cup mix together the warm water and egg replacer. Transfer to a small bowl. Add the vanilla, milk, and oil and whisk. Add the pumpkin and whisk until incorporated. Add the wet ingredients to the dry and fold together gently until mixed, but still with some lumps. If you whisk vigorously, the pumpkin has a tendency to become very chewy and you don't really want that. Grease the pan or griddle, and using a 1/4 cup measure pour the batter out into pancakes. Cook until browned, flip, and brown the other side.  Today will be my last post of Vegan MoFo. I didn't make it to 30 whole days of posting, but I did make it to at least the cut off of 20 posts. Yay! This was a fun month and I can't believe it's already over! I might take a week or two off from the blog, but will be back to posting soon. Now, I have two things to say about this recipe: 1) I believe this is by far the least healthy thing I have ever made (this is one recipe where veganizing it is still equally bad for you), and 2) making cinnamon rolls is a pain in the @$$. I started making them at 9:30am thinking I would have a late breakfast. It is now 2:45 in the afternoon and I just finished eating the first one. I would say that it would make it much easier if you started the rolls the night before. Once ready to be baked just stick them in the fridge and wait till the morning. That said, they're probably worth both the time/stress and the negative effects to your otherwise super healthy vegan diet. There are three main parts to the recipe: the dough, the filling, and the caramel sauce. I am not the sort of person who can just come up with my own original baking recipes, and so I used this Paula Deen recipe (I know, you don't need to say anything about it, none of us are fans, but I figure when it comes to cinnamon rolls, she's probably the best resource around). 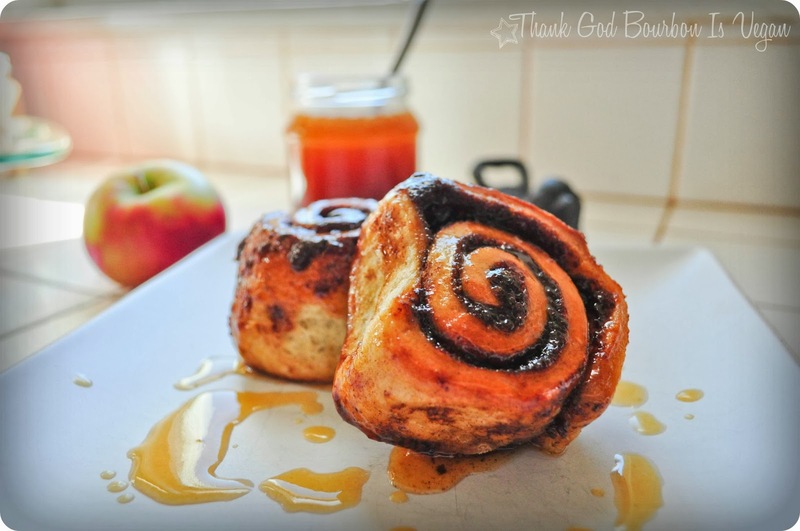 I veganized it and substituted ingredients to make it into apple cinnamon rolls. Recipe here. For the caramel sauce, I used this super-detailed recipe from The Brown Eyed Baker, but again, I veganized the recipe. (Recipe here). I will briefly describe how to make the caramel, but if you're new to making caramel (and because making caramel is terrifying) you should go to her site for more detailed instructions. Her directions are still applicable despite the vegan ingredients. 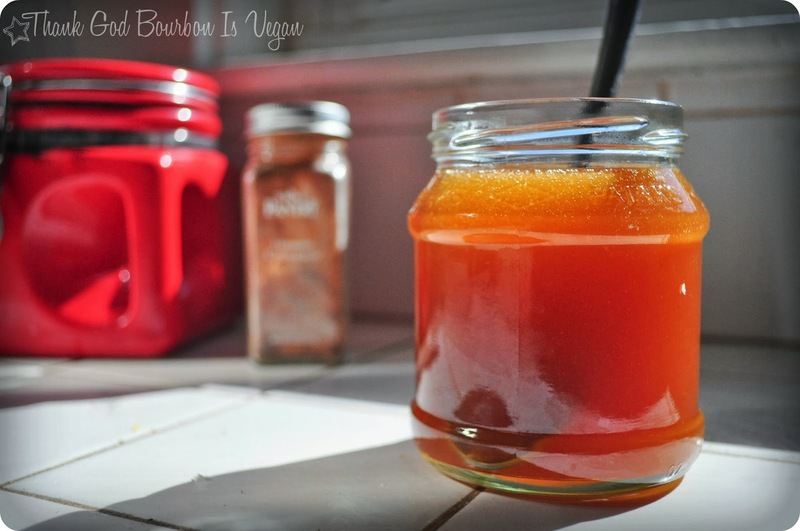 Also, this recipe will make much more caramel than you need, a little over 2 cups. I only used 1 cup for the cinnamon rolls. I wanted the extra caramel to be able to dip apple slices in, and to eat with a spoon. In a saucepan bring the cider, milk, and Earth Balance to a boil. Remove from heat as soon as the boiling begins and let cool slightly. Once the cider/milk liquid has cooled to about 100º-110ºF, sprinkle the yeast in, stir, and let sit for a few minutes to activate. In a large bowl, combine the sugar, salt, and egg replacer. Pour the liquid into the sugar mixture and stir to combine. Starting with 2 cups of flour only, stir flour into liquid until a dough forms. Continue adding flour until the dough is no longer sticky, but is still soft (I ended up using 3 cups total, but you might need more). Knead the dough for 5-10 minutes, and then place in a greased bowl. You will want to place the dough some place warm to help it rise. My house was chilly, so I heated the oven briefly (up to probably 90ºF) and put the dough in there. Let the dough rise until doubled in size, 1 to 1 1/2 hours. My dough did nothing for the first 45 minutes, because it was sitting in the cool house. Once I put it in the warmer oven, it doubled by the end of the next 45 minutes. While the dough is rising, prepare your filling. In a saucepan, melt 2 tablespoons of butter. Add the chopped apple, and sauté the apple for about 5 minutes, until browned. Remove from heat. Melt the other 6 tablespoons of butter in the microwave or in another pot. Combine the cinnamon and brown sugar in a separate bowl. Once the dough has finished rising, punch it down. On a floured surface, roll the dough out into a 9x15 inch rectangle. Pour half the melted Earth Balance onto the dough, and spread evenly using the back of a spoon. Sprinkle half of the brown sugar-cinnamon mixture over the butter and smear about evenly. Sprinkle the apple mixture across the dough, drizzle, with more butter, and sprinkle with the rest of the sugar mixture. Make sure that everything is spread evenly. Working from the LONG side of the dough (I made this mistake) roll the dough up (i.e. your dough should be a 15 inch long roll, not a 9 inch one). Cut the dough into 15 pieces (each piece about an inch thick). Grease a 9x13 inch baking pan, and place the cinnamon rolls in 3 rolls of 5. Let rise in a warm place for another 45 minutes (I know. More rising sad faces). Preheat oven to 350ºF. 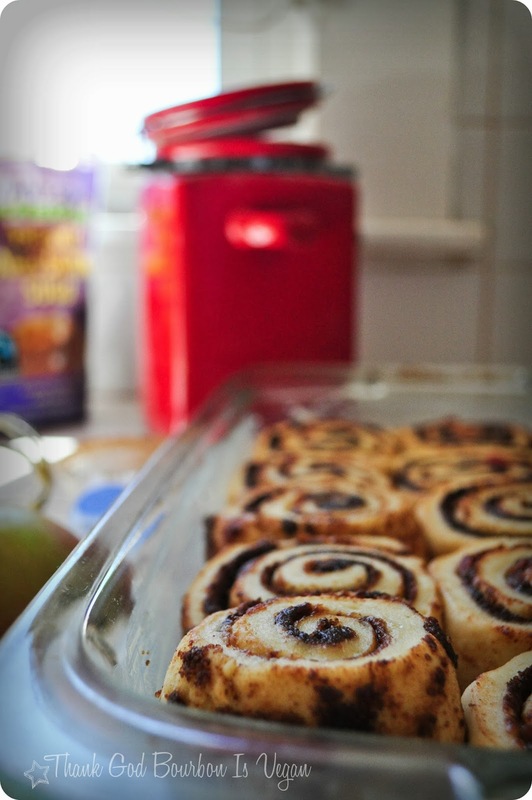 Bake for 30 minutes, until cinnamon rolls are browned. While the rolls are baking, make the caramel. Make sure that your butter and coconut milk are measured and ready to go near the stove where you will make the caramel. In a large saucepan, heat the sugar over medium-high heat, whisking frequently. Once the sugar melts, stop whisking, and instead tilt the pot back and forth to swirl the mixture. Continue to do so until the sugar begins to turn a deep reddish caramel color (again, the Brown Eyed Baker has pictures that will help make this clear. I am not able to multitask like that). Once you have gotten the right color, carefully add the Earth Balance to the pot, being aware that it may sputter. Continue swirling the mixture until the Earth Balance is melted. Remove from heat and add in the coconut milk, again, mind your sputtering. Whisk to combine. Add the salt and whisk away! 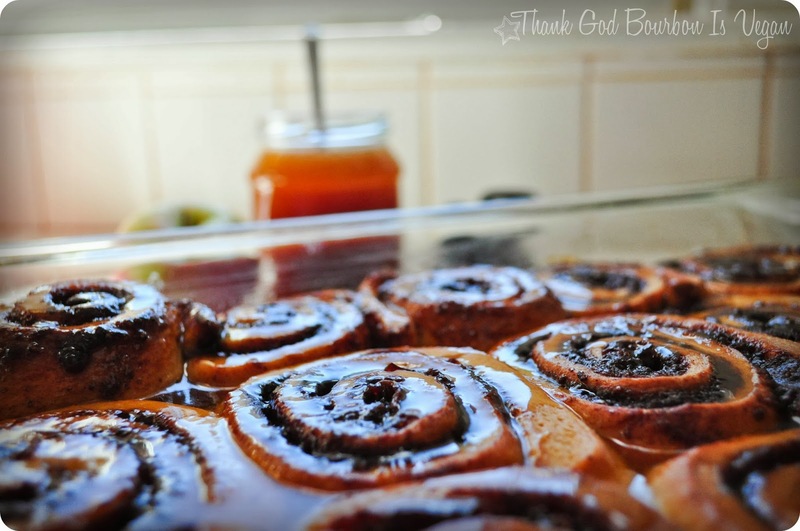 Once the caramel sauce has cooled slightly, drizzle 1 cup over the cinnamon rolls while they are still in the pan. You can reserve the rest of the caramel sauce for another use. It is almost Friday! 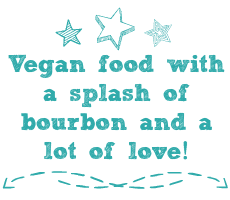 Today, despite the fact that it is the last week of Vegan MoFo (where did September go?! ), I am posting the very first official Thirsty Thursday recipe. 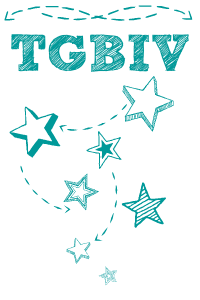 Thirsty Thursday is a trusty little invention that gives you the burst of ambition, fearlessness, and energy to make it through Friday and finally to the weekend. Or at least this probably applies to most people. Me on the other hand, I don't currently get weekends and I probably won't until December is over. I'm still trying to finish my graduate research, which I would like to have mostly wrapped up before I start my real job in a week (at this point this feels impossible). I'm also doing an internship for about 10 hours a week. So it's a lil' crazy right now. I'm pretty sure that since I moved to Boston I've always had about three different things on my plate. I worked at a cafe, and then at the admissions office to a wildlife sanctuary/local farm. But at the same time I volunteered to work with penguins and did research at a wildlife clinic. 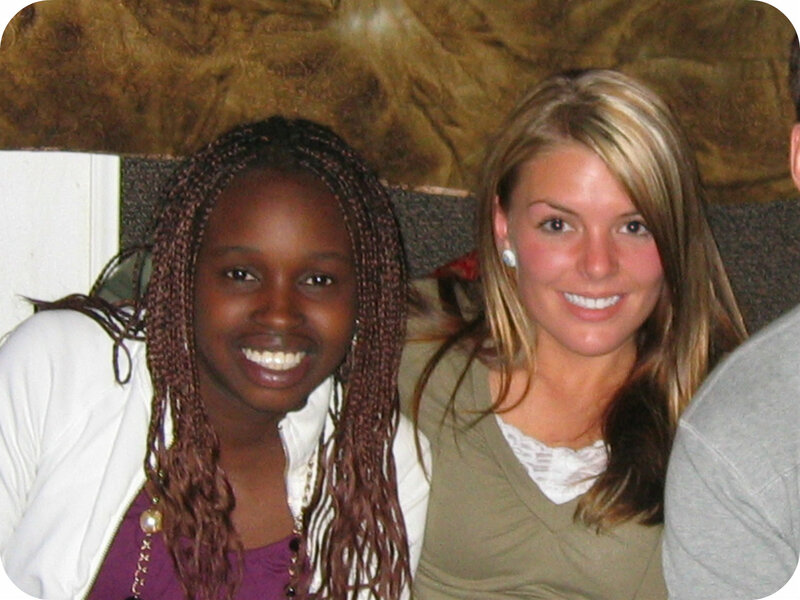 And then I did another internship with Humane Society International. And then school started and I had to wrap up that internship, and then I got a graduate research assistant position and then here I am with my thesis, another internship, and my first real job. There's never enough hours in the day and to think about it all makes me sleepy. I have loved all the amazing opportunities that I have been given here in Boston and I have enjoyed every second of it, even on the numerous all-nighters I had to pull during the last year to get my assignments done. But I am also really looking forward to life on a normal schedule, with a normal workload (i.e. 40 hours a week not all hours of the day). And there is a light at the end of the tunnel. Come December my internship will end, with any luck I will have completed all the requirements for graduation, and when I come back to work after Christmas, I can look forward to having exactly one, full-time commitment and a regular adult schedule (with the exception of working with people across the world who are in different time zones, but really, that's fine by me because that's actually really exciting). So, that said, maybe it makes more sense why there haven't been any Thirsty Thursday posts. Thursday rolls around and it's like, I really don't have the time to drink right now because I have to work until 1 in the morning on this project. So last weekend I was prepared. I took pictures of this drink so that everyone with a normal, structured life could enjoy at least one Thirsty Thursday. 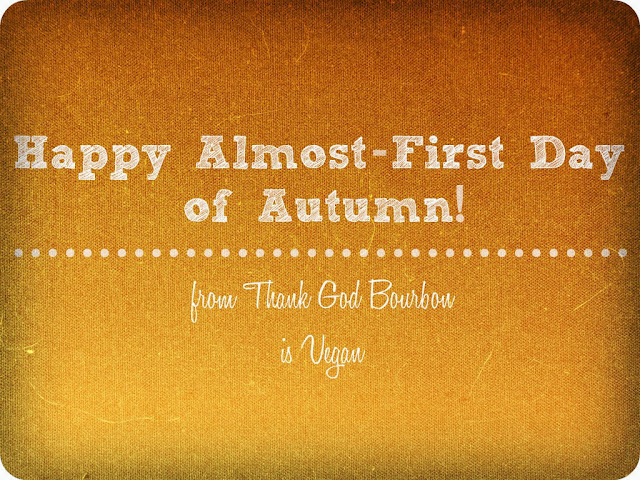 So here it is: Fall in a Glass. 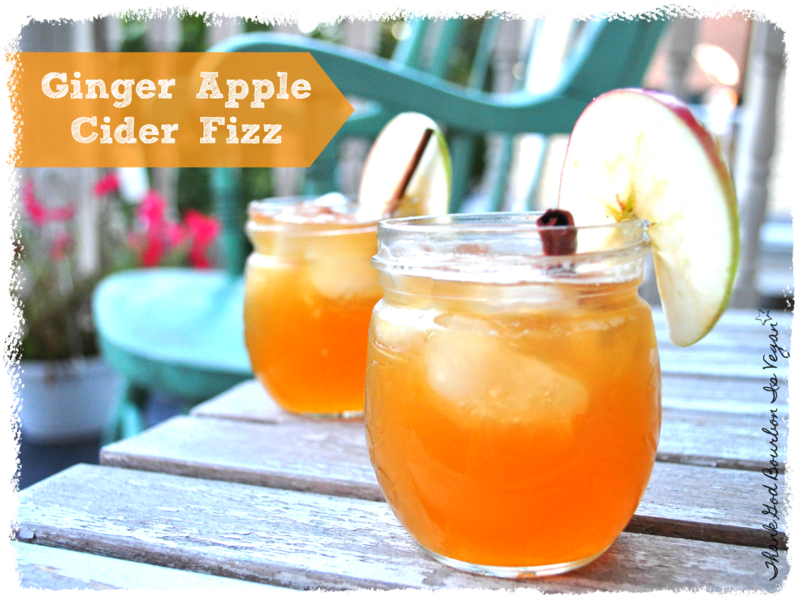 I give you the "Ginger Apple Cider Fizz"
The key to success here is to use ginger BEER, preferably Reed's Extra Ginger Brew. If you use something like Canada Dry Ginger Ale all you will get is a cloyingly sweet concoction that will probably make you wish you had never lived come morning. 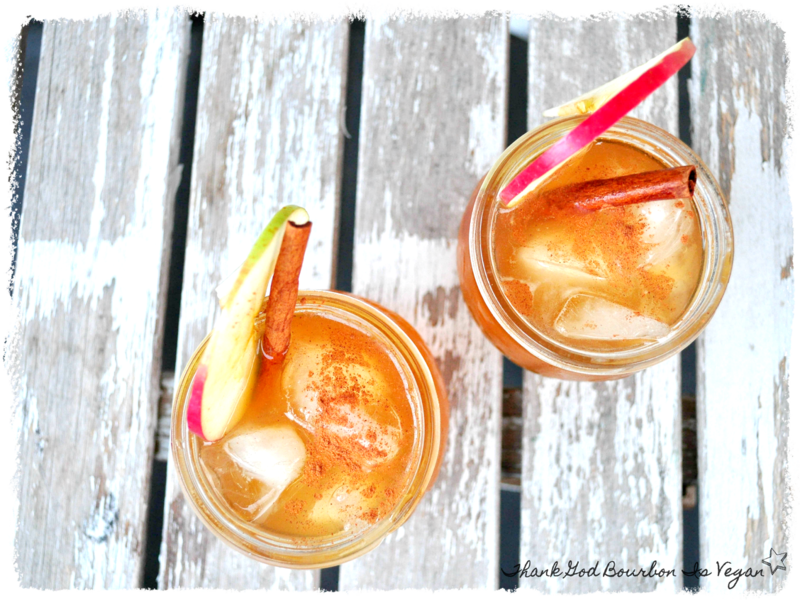 Pour the bourbon, cider and ginger beer into a glass. Dash with cinnamon and stir. 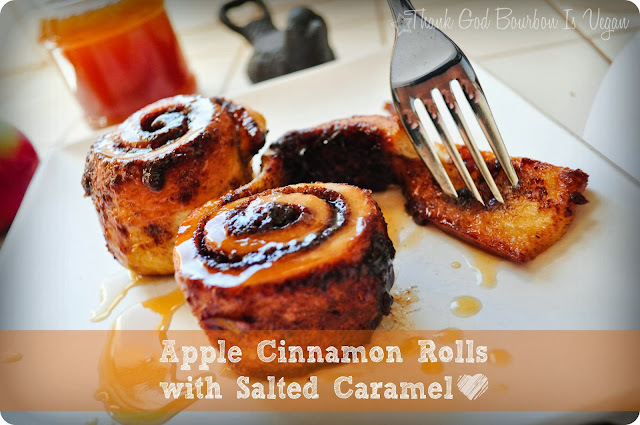 Add the cinnamon stick and apple sliver to make it pretty, but they're not absolutely necessary. To make the apple slivers simply cut an apple along it's horizontal axis, and then make a cut from the edge, to the center of the little star where the seeds were. You can use this slit to attach the apple slice to the rim of the glass. I think I have said it before, but Indian food is one of my favorite types of foods, just like India is one of the places I most want to go. 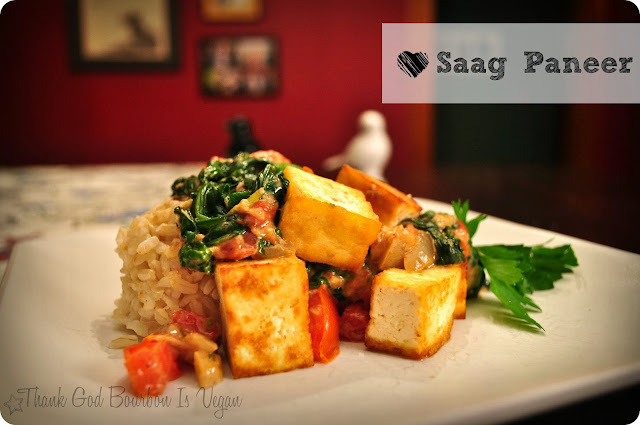 Here is my version of Saag Paneer, one of my favorite types of my favorite type of food. Saag Paneer refers to a spinach sauce with cubes of cheese (similar to mozzarella). It is usually served on rice. I made the recipe about a week ago, and then today, when I was preparing to publish it, I could not find it. I was positive I had thrown it away and that I was going to have to publish a post explaining why there was a picture and no recipe. But alas! I found it hiding in the kitchen drawer. Thank goodness. Here I substitute firm tofu for the cheese, and fry it in Earth Balance to give it a richer taste. Often this sauce is served on rice. For mine, I used brown rice because it is healthier. There are a lot of recipes for white jasmine rice which have a little more flavor added to accompany the saag (or other Indian dish), but for simplicity's sake (this is supposed to be a weeknight dinner) I opted for plain brown rice. You are more than welcome to find a Indian rice recipe and use it to accompany the sauce. First prepare the "paneer." In a large skillet melt two tablespoons of the Earth Balance over medium-high heat. Once melted, add the cubes of tofu, turning every few minutes so that all the sides are browned. Remove from heat and keep warm. Add the remaining two tablespoons of Earth Balance to the skillet and melt over medium-high heat. Once melted add onion and sauté until translucent, about 5 minutes. Add the garlic, ginger, and serrano, and sauté until fragrant, stirring frequently, about 2 minutes. Add the garam masala, coriander, cumin, and salt and saute for 30 seconds. Add the spinach, cover and continue to sauté until the spinach is wilted. Add the tomato and cashew cream and continue to cook until the tomato has broken down, stirring to incorporate the cashew cream. Return the tofu to the pan and toss it with the sauce. To serve, ladle sauce and cheese on top of cooked rice. *For the cashew cream you can use 1 cup cashews. Soak them in water overnight or boil them. Rinse, and put in blender. Add 1/2 cup water to blender and blend until smooth. This will make about 1 cup cashew cream, so you will have 1/2 cup left over for another dish. Mix the ingredients together until a dough ball forms. Knead the dough for several minutes. Using a pasta roller, roll the dough out into thin sheets. Using a round glass or tupperware with a diameter of about 2 1/2 inches, cut the dough into little circles. Rinse the cashews and place in blender. Add the water and blend until smooth and thick. Using a spatula transfer 1/2 cup of the mixture to a small bowl (reserve the other 1/2 cup for another use). Add the tofu, nutritional yeast, salt, pepper, and nutmeg, and stir to combine. To make the tortellini, spoon a teaspoon of the mixture into i circle of pasta. Fold the pasta in half over the filling, and press along all the edges, pushing the air out and sealing the filling in. Press your finger on the center of the filling, wrap the two corners around your finger, and press them together until sealed. This will give you the classic tortellini look. Heat olive oil in a large pot over medium-high heat. Add onion, garlic, fennel, and sausage, and saute until browned. Add thyme and red pepper flakes, and then the broth. Bring to a boil. Once boiling add the kale and cannellini beans. Reduce heat to medium. 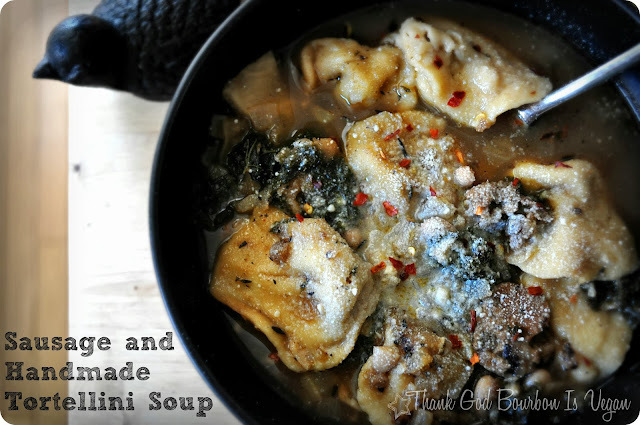 Once the kale is wilted you can add the tortellini, and cook for an additional 5-10 minutes until the tortellini is firm and is floating. Ladle soup into bowls, being sure to get both broth and goodies from the bottom. Sprinkle with parmesan. Serve with some crusty bread. Here comes another one of those Monday posts. Today's breakfast on the go is oatmeal. I'm sure you know how to make oatmeal already, but what's different here is that you take your oatmeal with you. Here's how. 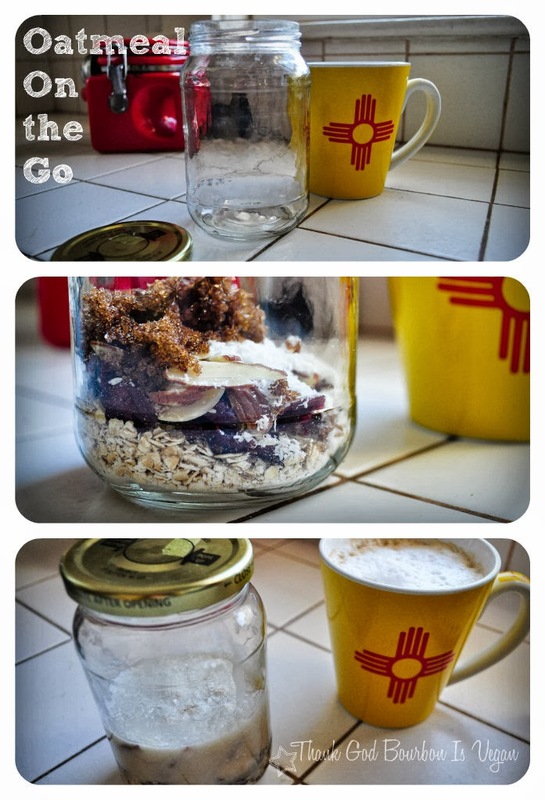 The best way I have found to take oatmeal with me is by repurposing an old jar. The best size of jar is that of a salsa container, which, I unfortunately did not have this morning and had to make due with some mystery jar that was a bit too tall. I like the salsa jars because they are short and wide, which makes it easier to eat the oatmeal out of. I usually put all the ingredients in the jar (including the soy milk), put the lid on and throw it in my bag. Then, when I get to my destination I microwave the oatmeal for about a minute and am ready to eat! I don't really think there's much reason for recipes for single serve oatmeal, it's more for personal preference so I'll just tell you what was in mine. Quiche seems like a difficult thing but it's actually not that bad. The first time I made this quiche I left the phyllo to hang over the edge of the pie plate (as shown), but the second time I folded the corners towards each other to meet in the center of the quiche. I actually liked this version a lot better, but it wasn't as photogenic. I recommend that you fold the phyllo towards the center as well, so that the quiche has a crust both on the top and the bottom. This is a pretty basic quiche, but you can get fancy and change up some of the ingredients if you like. I think I would like to try making a cheddar cheeze broccoli one sometime. Also, I roasted my own red pepper on my gas burner. To do this just turn one of the smaller burners to hight heat, and set the pepper on the grate above it. Turn occasionally, once each side has turned sufficiently dark. Once all sides of the pepper have been blackened, you can place the pepper in ice water, to make the peeling process a little easier. Peel the pepper, remove the stem and seeds, and you're good to go. Alternatively, you can use the jarred peppers, I just don't like that they taste watered down and pickled. First, prepare the filling. In a medium skillet, melt the Earth Balance over medium-high heat. Sauté the shallots and garlic until browned. Add the mushrooms and cook until they have released their moisture. Add the spinach, and cover, cooking until the spinach has wilted. Transfer to a large bowl. Add the tofu, pepper, mozzarella, parsley, nutritional yeast, mustard, Sriracha, and black salt and stir to combine. Preheat the oven to 350ºF. Remove the phyllo dough from the box and roll out flat. Have your 9-inch pie pan ready. Brush the first sheet of phyllo dough with olive oil, then transfer to the pie pan, placing the oiled side down. Repeat with the next 7 layers of dough, remembering to put the oiled side down. Press the dough into the bottom of the plate (it will hang over on all sides). Spoon the filling into the pie pan and flatten out with the back of the spoon. Fold each corner of phyllo dough towards the center of the quiche, and then press to flatten slightly. It's okay if it's ugly right now. When you cook phyllo dough it makes everything beautiful. Place in oven and cook for about 20 minutes, until the phyllo is evenly browned and the filling is warmed through (Another great thing about vegan cooking is you don't have to worry that the center of your quiche is still liquid even though the outside is burning, yay!). Cut into four wedges and serve. 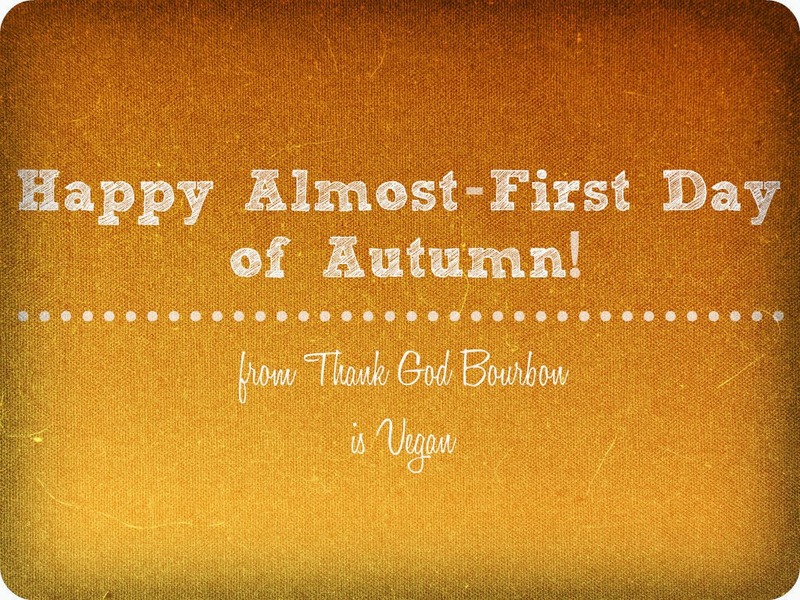 If you've been reading my posts, you know that I really wasn't ready for fall. I think I am slowly coming to terms with it. I'm even a little bit excited for it! 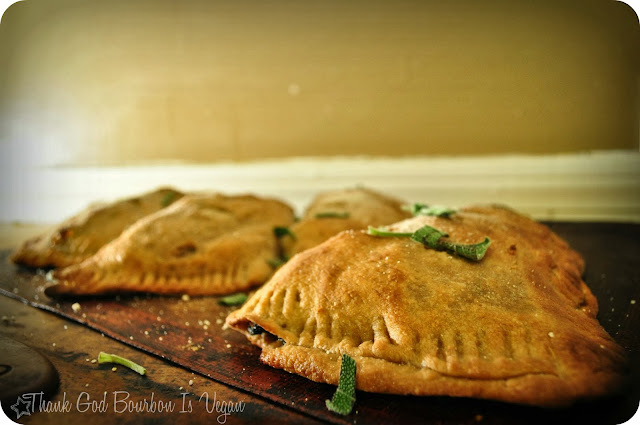 I know it is actually the day before fall officially begins, but I am posting this today so that you have time to grab the ingredients to make these calzones in celebration of the first day of autumn! 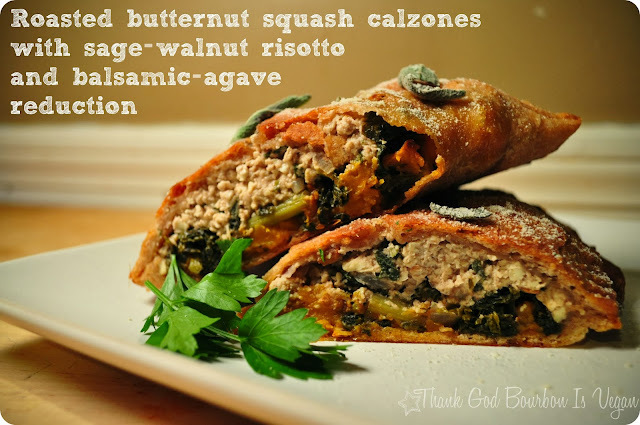 They are stuffed with butternut squash, kale, balsamic, walnuts, and sage. They're pretty much autumn hot pockets. I like these because despite the looks of them they're actually amazingly healthy. They have butternut squash and kale, which together provide lots of vitamin A, vitamin C, iron, and calcium. But the best part is the risotto. Whereas the non-vegan version would have some protein but also saturated fat and cholesterol the vegan version--tofu, walnuts, and pine nuts--replaces the saturated fat and cholesterol with healthy omega-3 fatty acids (plus adds a unique and fall-ish flavor!). First, prepare the butternut squash. Preheat the oven to 400 ºF. Place the butternut squash cubes in in an oven-safe baking dish. Drizzle with oil and sprinkle with salt and pepper, then toss to coat. Place in oven and bake for 15 minutes. Stir and return to oven. Check and stir at 10 minute intervals until the squash is tender and nice and browned. Meanwhile prepare the kale and risotto. For the kale, heat the olive oil in a skillet over medium-high heat. Add the garlic and saute for 30 seconds. Add the kale and cover. Once the kale has wilted, stir in the balsamic vinegar, and set aside. For the risotto, wipe out the pan with a paper towel, add the Earth Balance and return to medium-high heat. Once the butter has melted, add the shallots and sage and sauté until the browned. Remove from heat. Place the pine nuts, the boiled or soaked walnuts, and 1/2 cups water in a blender. Blend until as smooth as possible (the walnuts will remain somewhat grainy, this will not be as smooth as cashew cream). Transfer to a large bowl. Add the sage, shallots, tofu, and nutritional yeast. Stir to combine. Cut the pizza dough into 4 pieces. Using plenty of flour, roll each piece until it about a quarter inch thick. Note that because of the way the dough has been cut, you will probably not be able to form a circular piece of dough, it will want to stay in a triangle. This is actually perfectly fine, don't let it bother you. Once the butternut squash is done roasting, you can begin to assemble the calzones, but before you do, be sure that the oven is still at 400ºF. To assemble, distribute the butternut squash among the four calzones, placing it on only one half of your triangles. Follow with the kale, and finally with the risotto. Fold the half of the calzone without filling over the filling, stretching so that the dough entirely encapsulates the filling and is in contact along the entire perimeter. With a fork, press the edges of the dough together (see picture above) so that the dough will not come undone. With a knife pierce the tops of each calzone about three times to make room for steam to escape. Place on a baking sheet, brush with olive oil (to help them brown better), and put in oven to cook. Check the calzones after about 15 minutes.Once they have turned golden brown, they are done baking. Finally (finally!) while the calzones are baking prepare the balsamic reduction, which will be the dipping sauce. In a measuring cup, whisk together the balsamic and the agave. Pour into a small saucepan and heat over high heat. Once the mixture boils, reduce heat to medium and simmer until reduced by about half. Remove from heat, and place in fridge to cool. As it cools the reduction will become sweeter and thicker. Serve the calzones with the balsamic reduction in a small dipping bowl. 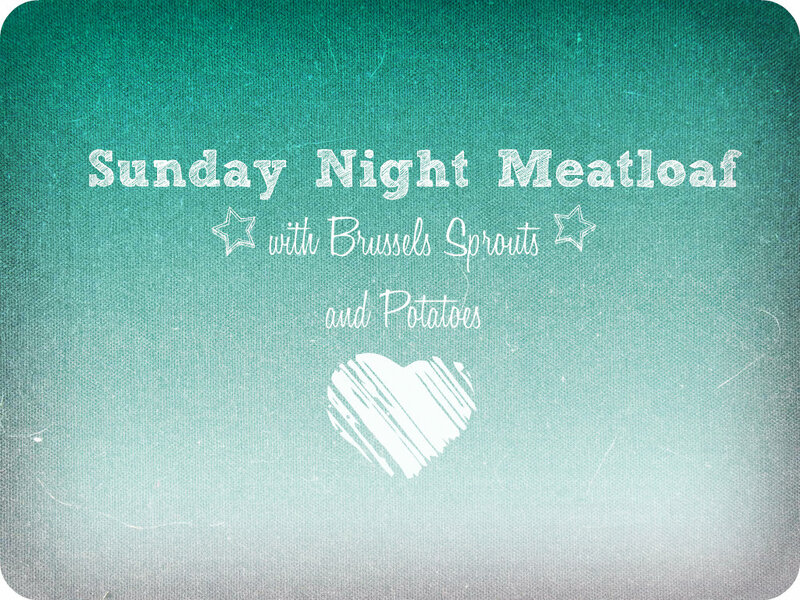 This dinner is for the most hurried of weeknight meals. It takes only 15 minutes to put together, but is healthy and satisfying. Chickpeas give the texture of cooked egg yolk and diced soft tofu gives the illusion of chopped egg white. There's not a lot to it. Toast bread. To prevent the bread from getting soggy with the salad, place a leaf of lettuce between the bread and the salad on both the top and bottom of the sandwich. Distribute the avocado and tomato slices between the sandwhiches, scoop salad onto each sandwich, and assemble. Here goes another pretty basic Monday Morning post. 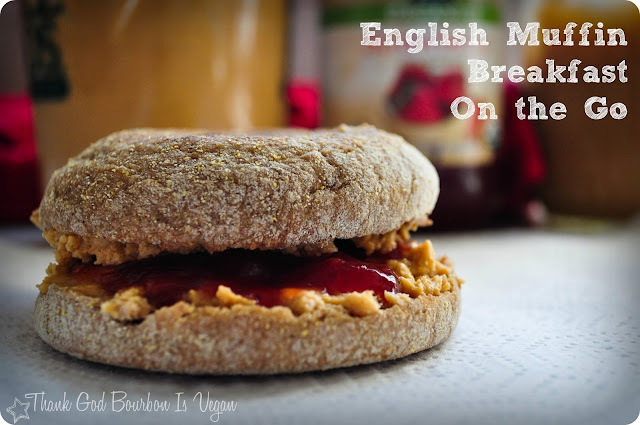 I like this breakfast because if you buy whole grain English muffins they can actually be quite nutritious. The ones that I have been buying have about 8 grams of protein and 4 grams of fiber. 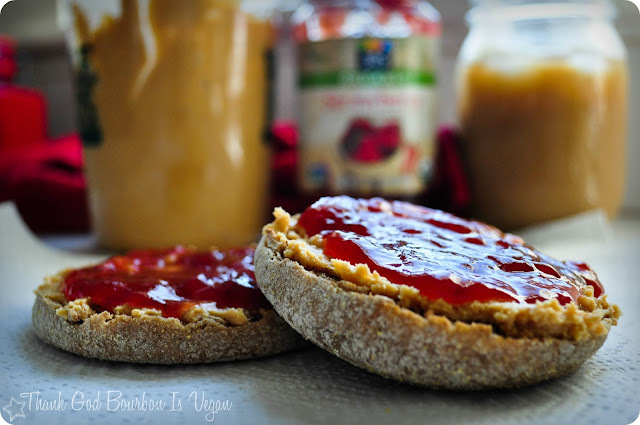 Add two tablespoons peanut butter (8g protein) and jelly and you have a nice breakfast that is high in protein (more protein than two eggs, and for someone at 115 pounds about a third of your daily protein requirement). So that's a pretty good start to the day, not to mention that the jelly will give you a little sugar rush (shhh.... that's the less healthy aspect but I'm willing to accept that). So there's not really a recipe, just a toasted muffin, two tablespoons peanut butter, and a tablespoon jam. You can put the halves together, wrap it with a paper towel and secure with a rubber band (from your produce of course! No need to buy rubber bands. If you're vegan and you don't have an excess of rubber bands from your produce you're not doing it right). Done. Enjoy on the subway and you can use your paper towel as a napkin. Ultimate time-saver. 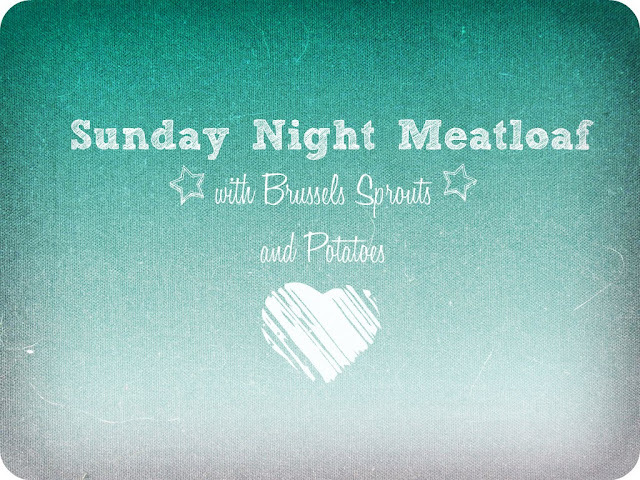 When I first started this blog, I made a pictorial guide to making seitan. The pictures were horrible. I'm pretty sure people who saw them were left horrified and hoping that they never ever ever came across this "seitan." 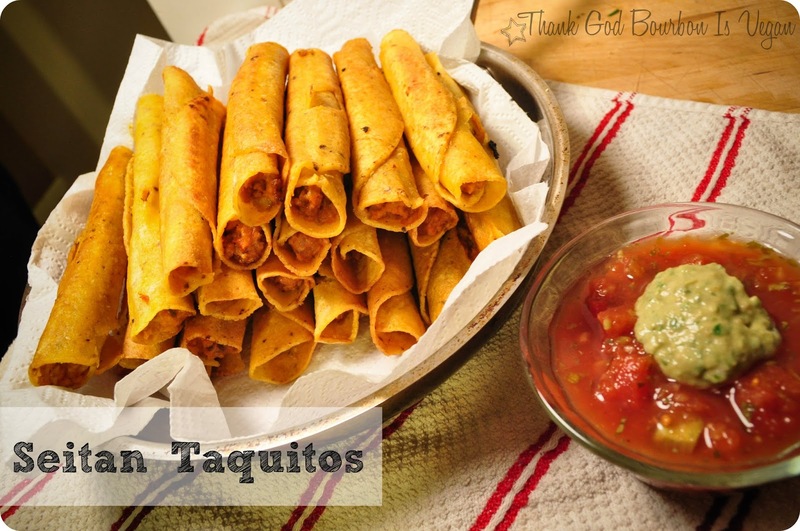 Time for round two, because homemade seitan >> store bought (although, as we will see in a few days, there's nothing wrong with store bought seitan in taquitos). 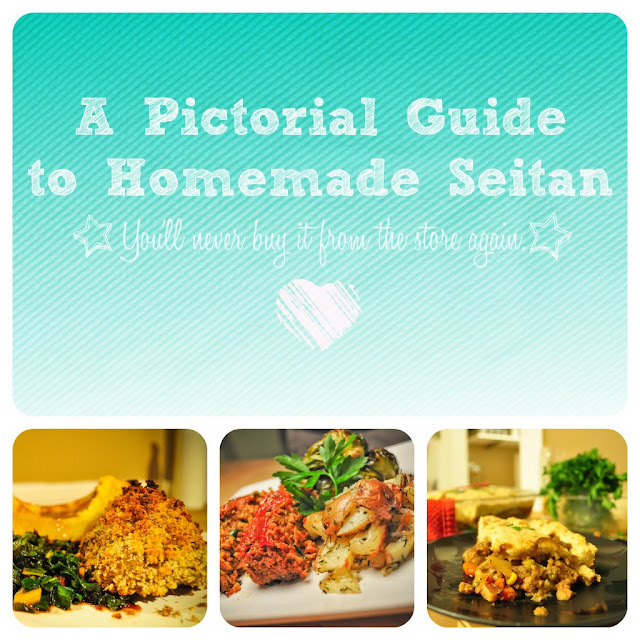 So hopefully this pictorial guide will make seitan look a little bit more appetizing, and a little bit more approachable. It's actually very easy, the only time consuming part is waiting for it to cook. For those of you haven't tried seitan, which probably isn't many during Vegan MoFo, but just in case, it's a pretty decent substitute for meat, but the benefit is that you can make it in your kitchen and not feel super suspicious about how it was made. 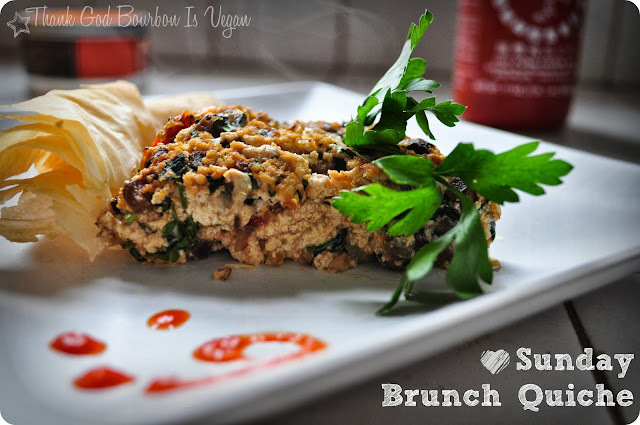 It has a meatier texture and umami taste than tofu or tempeh do. Buddhists have been making it for thousands of years. Another good thing about making it at home is that you can flavor it how you want to depending on what you're using it for. You can either mix herbs and spices into the dough or add sauces to the boiling broth. Experiment and have fun! 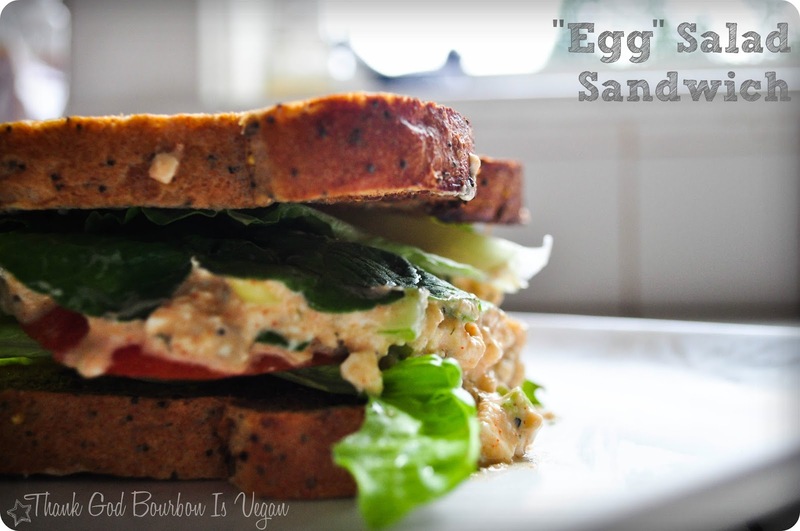 The other good thing is that you can add nutritional yeast, which supplies extra protein and B12. First, mix together the gluten, nutritional yeast and spices in a large bowl. In a measuring cup mix together the water, broth, soy sauce, Worcestershire sauce, and olive oil. Pour the wet ingredients into the dry and mix until combined. Using your hands makes this easier. Once a ball of dough has formed, powder a clean surface with more wheat gluten. **This is the important note you will see below** To make sure that your seitan is firm and not spongy, you need to make sure that it has absorbed as much gluten as it can, and this ratio will change depending on the humidity. For this reason I knead my seitan with wheat gluten until it no longer feels very moist, and until it has difficulty binding to itself. Keep kneading until you have incorporated as much gluten as possible, the dough springs back when pressed, and strings of gluten are visible. Cut the dough first into quarters, and then halve each quarter to make eight pieces. Knead these pieces briefly to try and produce a more appealing shape. To make the boiling broth, simply add the water, veggie broth concentrate, and soy sauce to a large pot. Drop the seitan pieces in. Bring to a boil then reduce heat to medium-low. Let seitan simmer for an hour until it is firm and no longer gummy in the center (you may have to sacrifice a piece the first few time until you have a good feel for what it should look like!). Today is a day of remembrance. 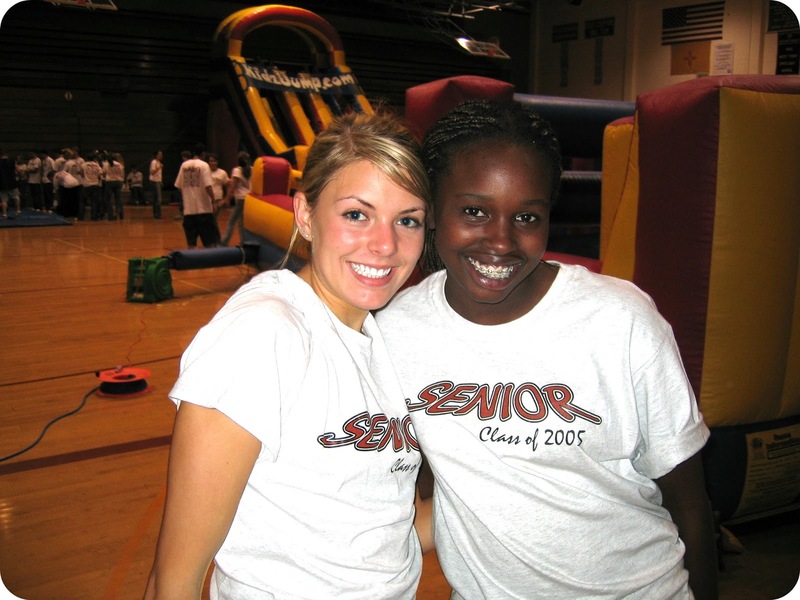 Twelve years ago I was a freshman in highschool. I still remember hearing the news on the radio while I was getting ready for school, and then walking out to ask my Mom what the twin towers were, because a plane just flew into one of them. I grew up in Albuquerque, where you can be out of the city and into the vast expanse of the desert in probably under 20 minutes, even from the heart of the city. There are no skyscrapers. I had never even been to the east coast, and while I had been to Los Angeles, the concept of Manhattan, over eight miles of rows and rows of skyscrapers, well, it might as well have been on the moon. You see it in movies, but it doesn't really exist for you because you can't relate to it and you've never seen it for yourself. Moving to Boston, and then visiting NYC and seeing the new tower being built made 9-11 a little more real. Michelle and I stopped in a Starbucks right next to the tower while we were there, and it was eerie to think about everything that the walls of that building had seen. And then there was the Boston Marathon. Obviously, Boston was lucky and the loss of life was small, but during that week it seemed as though anything was possible. Daniel was at work downtown when the bombs went off. My neighbor asked to barrow my cell phone to try to reach his wife who was supposed to have been at the finish line. Then there came the end of the week, when I got a late night text from Jess saying a police officer had been shot at MIT, and then the next morning when I would have been heading to Watertown to meet Jess to carpool to class. I woke up to a text saying, "Stay away from Watertown." The bomber was alleged to be hiding out and Watertown, as well as most of Boston, was on lockdown. Later that day, Daniel and I lost all connection to the outside world. We couldn't make phone calls, use the internet, use the internet on our phones, and the power was out so we couldn't watch the TV or listen to the radio. Neighbors were outside in their cars, because the car stereo was the only way to keep up with what was going on. Meanwhile cop cars drove down the street ominously and black hawk helicopters zoomed by overhead. The feelings I had that week are hard to explain. One was obviously fear. Fear because I did not know how or when it was going to end. The other was a sense of being trapped, because where does one go? Where is safe? If I try to leave will I be stuck on the freeway? But the hardest one was heartbreak. Watching the images on television and not yet knowing what the death toll was going to be, and seeing blood strewn across a sidewalk that I had walked down countless times left a pit in my stomach.  Life is impermanent. It is fragile. And these walls we build around ourselves that make us feel safe and secure? They are illusions that can disappear at the drop of a hat. I imagine that the feelings I had during that week, strong as they were, cannot compare to what those in NYC must have felt. But there is something important here, beyond the fear. Every 911 we are forced not only to remember the event, but also we renew our resolve in our reaction to the event, whatever that reaction might be. I remember after 911 reading in the paper some statements from religious leaders regarding what the attack meant on a deeper level. Many of these statements focused on the feeling of pain, anger, and victimization. However, there was a response from a Rabbi that stuck with me. He said something along the lines of "God is not in the disaster, God is in the response." What is important to focus on in these terrible events is not the darkness that led to them, but the light in the responders, the compassion of people to pure strangers, and the strength of a community to pull together and take care of those in need. For Boston, you could see this in the Google doc where people offered their homes to those who were stranded after the bombings and through photographs circulated of extension cords leading outside of peoples' apartments so that anyone passing by who needed to charge their phones could do so. Amidst the fear was compassion and a common resolve to take care of each other. I believe that this is the most important thing to remember. Many people internalize the fear, pain, and anger, and resolve themselves to retribution and revenge. This makes me sad. The world is dark enough without us reacting to it with anger, fear, and retribution. On some level, every act of violence and cruelty is perpetrated because of a sense of revenge or entitlement. The 9-11 attack was perpetrated because a small number of people had such strong ideological convictions that their humanity was stifled, and they believed that America in some way deserved the suffering and pain inflicted by 9-11. When we turn around and say that Muslims (or any group) deserves to suffer for whatever act they have perpetrated against us, we are taking the darkness of the world and reflecting it back. It is like holding a mirror up to a mirror, and looking through the long corridor that appears. It eventually ends in black. It gets us nowhere new, and certainly nowhere better. It takes true courage to put the mirror down and learn to forgive, but it is the only way that we can find peace, both with ourselves and with the world at large. An eye for an eye makes the whole world blind. So today, many people will say, "9-11, never forget." This phrase has always struck me, because, well, never forget what, exactly? Everyone will inevitably finish this phrase with their own interpretation. Obviously, never forget the lives that were lost. But there has always been an unspoken element to this phrase, and that is, "never forget why we must get retribution." For this reason I've always been ambivalent to the phrase. So today I would like to add something to it, and that is, "Never forget, but always forgive." The world has plenty of hate, anger, sadness, and fear. 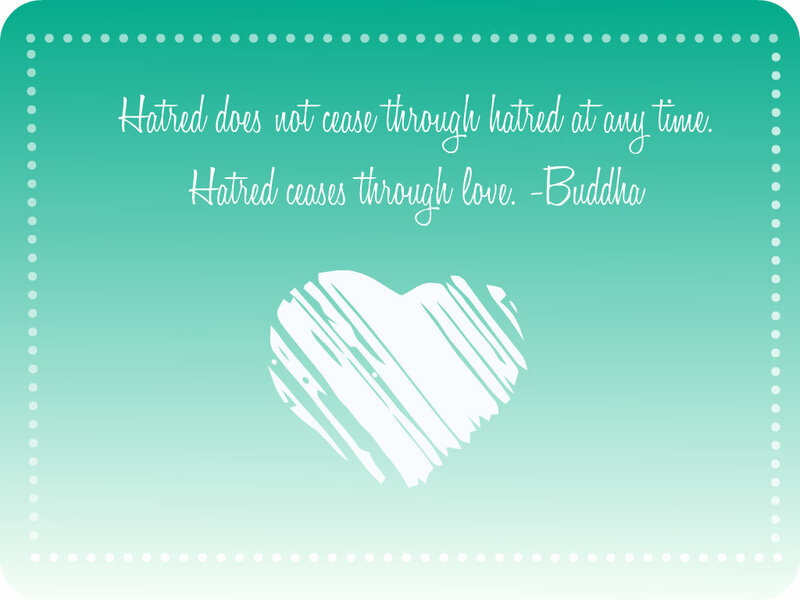 What it really needs is compassion, forgiveness, mercy, and love. 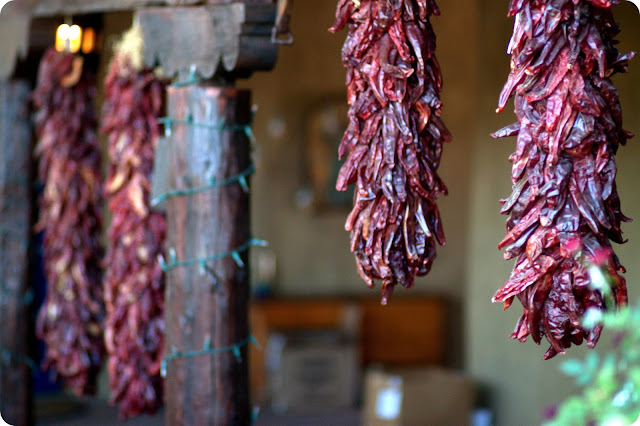 You will often see these hanging red chiles, called ristras, in New Mexico, especially during the fall and chile harvest season. This picture happens to be from our wedding. They're everywhere. A note about red chile. Having recently been to New Mexico, I picked up a bag of hot, ground red chile at a farmer's market in Santa Fe. Somewhere along the lines I vaguely remember seeing a disclaimer that said not to use this red chile for making sauce as it was too hot. Yeah right, I said. I can handle it. I'm a New Mexican at heart. I loved it and worked through the pain. My nose ran, my eyes watered, and I got the hiccups. And I enjoyed it because I am a New Mexican at heart. But most normal people are not going to enjoy their dinner if it tortures them and makes them cry. So with that in mind, I'll say one thing. Know your chile tolerance. If you're outside of New Mexico, it's likely that "hot" chile won't even be available to you. If this is your first time making red chile sauce, or your first time with New Mexican food in general, I suggest starting with a bag of "mild" red chile, which should be easy to find. I can find it at my Whole Foods with no problem. If you eat this and have no problems, maybe try "medium." But whatever you do, don't start off with the one labelled "hot" because chances are you will regret it. Anyways, because I wanted to veganize this favorite, I opted for seitan instead of the pork. 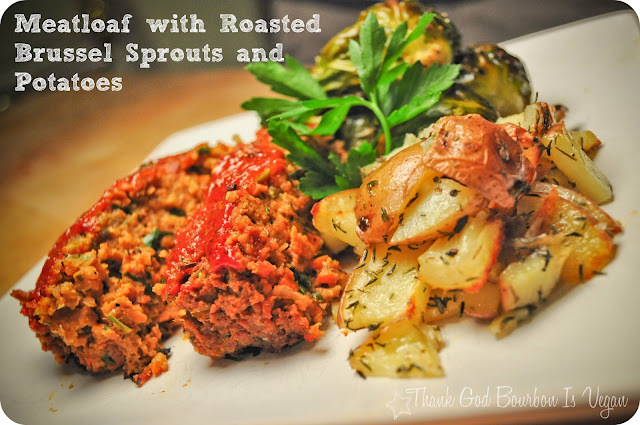 As an added bonus, this makes this dinner much faster to make because it doesn't require marination, and it doesn't require a long stewing time to become tender and edible. I basically made the sauce and then cooked the seitan in it until I felt that the seitan had absorbed enough flavor. The sour cream is made from raw cashews. 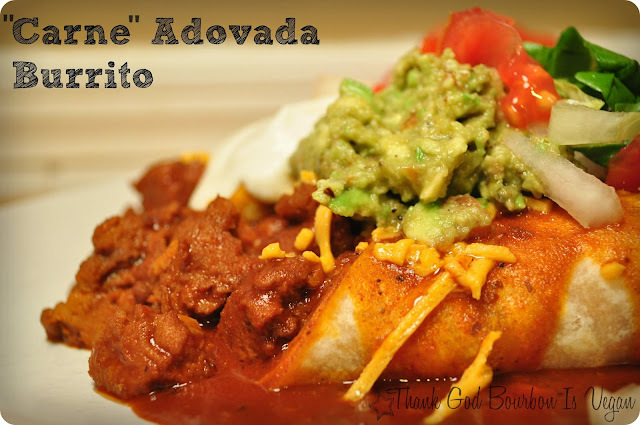 Before starting the carne adovada, prepare the cashews if making the sour cream from scratch. Simply place the cashews in a microwave safe bowl, cover with water, and microwave on high until the water is bowling. Set aside until ready to use. Heat the oil in a 4-quart pot over medium-high heat. Add the onion and saute until translucent, about 5 minutes. Add the garlic and saute 30 seconds. Add the red chile and the flour, stir, and saute for another 30 seconds. Add the broth, stirring to combine, and then add the seitan. Turn the heat up to high. Bring to a boil and then continue to cook at high heat until the sauce is thickened and reduced, about 15 minutes. While the carne adovada is simmering, strain the cashews and place in a blender. Add the water, lime juice, and vinegar. Blend until smooth. Mash the avocado with the back of a fork. Add garlic, lime juice, and cilantro and combine. To serve, place the seitan into the tortillas using a slotted spoon. Roll the tortillas, and then using a ladle top each tortilla with the remaining sauce. Sprinkle with the cheese and broil until melted. Top with the sour cream, guacamole, lettuce, tomato, and onion, and enjoy! No! Not me! The other Jess. The one that has the same name. Who's boyfriend is also her high school sweetheart and is named Dan. Just like my Daniel is my high school sweetheart. Oh, and did I mention that Jess and I happened to move to Boston the same fall, and applied and were accepted to the same grad program (of only twelve students) the same year? That we're both vegan and that we were the only two students commuting over an hour to school from Boston and so obviously commuted together? That on the first day of school she got out of the car, I took one look at her shirt and burst out laughing because I had the exact same one at home? That we both moved to Boston so that both our Dan's could go to graduate school at MIT? That both of these Dan's got their undergrad degrees in mechanical engineering and were on their schools' FSAE (race car building) teams? That we're the exact same height? So there's that. I don't know how that's possible, but the best part was when we first met, because it just happened to work out that everything Jess said, I responded to with, "Oh, me too!" Like some bizarre copy cat compulsive liar. I was afraid to friend her on Facebook for fear that she would think I was stalking her. 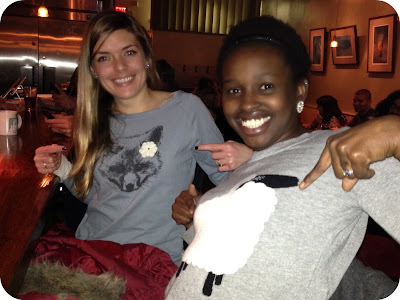 But eventually, all was revealed as true, as implausible as it sounds, and Jess and I became fast friends. 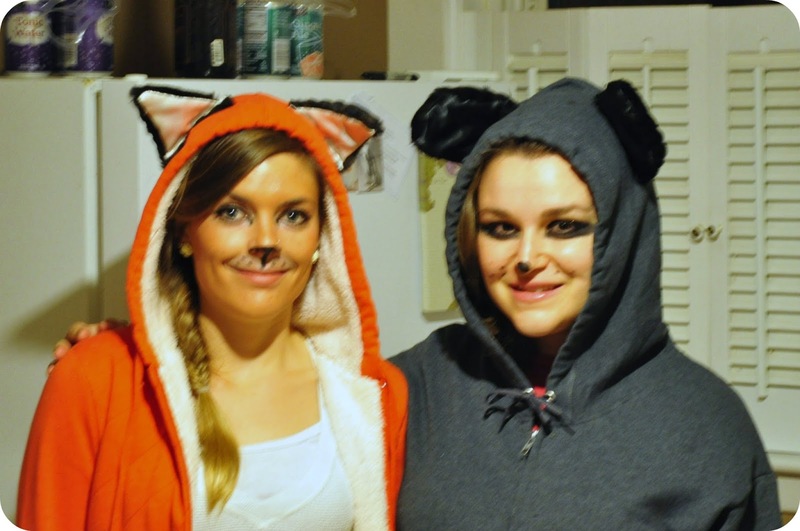 We even dressed up as a raccoon and a fox for Halloween, because apparently I am the best at making friends on Halloween and because apparently I only dress in animal costumes (see last week's Who's Day Tuesday if this makes no sense) #Icantwaitforthisyearscostume. In our program we had some really emotionally straining days, like when we visited a huge pig farm, when we saw how they dehorn calves, or when we spent class with guest speakers who included a rabid dog breeder and a poultry expert who demanded someone name a religion which opposed the use of poultry without being vegetarian (why this specifically and how it falls under the purview of a poultry production expert I was never sure). I was always glad to be able to laugh or cry about it with Jess for the next couple hours in the car. To be honest, I'm pretty sure that the number of people in the world that I could spend 2-4 hours a day, 4 days a week for an entire school year in a car with and not want to kill, is precisely one, and that one would be Jess. 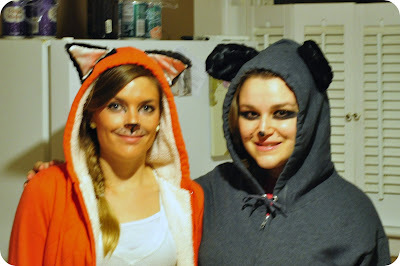 :) Thanks for putting up with me and my incessant yammering lady! Hi everyone! My name is also Jess, which will make it that much easier to hijack my friend’s fabulous blog for a day (cue evil laugh). 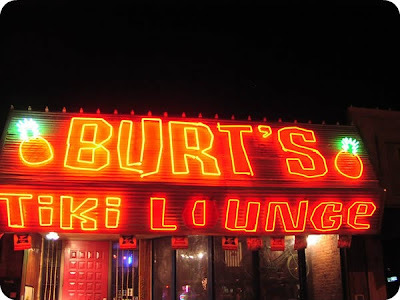 Just kidding, I was invited. But it is true that we have the same name and a shared love for animal rights and amazing vegan food. Today, I’m sharing a classic Romanian dish that I’ve loved since childhood, which also happens to be vegan! My parents immigrated to the U.S during the communist regime in Romania. I was born here in the U.S. but learned Romanian as my first language and was brought up eating Romanian food. Romania is a gorgeous country, a little known gem, and if you have the chance to visit, you should. We’re even home to Dracula’s castle! I’ve made it out alive twice! Unfortunately, it’s also one of the poorer countries in the E.U., and during the communist years food was rationed and resources scarce; YET Romanians have created a delicious cuisine based on cheap ingredients that combine with sublime simplicity into dishes that never disappoint. I hope you enjoy one of my all-time favorites below for a little taste of Romania! Start on the topping first (it takes a while to cook and you can make the dip in the meantime, just be sure to mix every few minutes to avoid burning.). Peel onion and slice into thin, long strips. Add the vegetable oil to a frying pan, use to coat pan, then add the onion. Saute onion on medium heat until browned (usually about 15-20 minutes so that the onions caramelize). When onion is nearly done (~5 min left) add tomato paste and mix with onions and oil, allowing it to cook together for a few more minutes. While the onion sizzles, start working on the dip. Drain and rinse the beans, then place them in a large bowl. Using a potato masher, mash the beans until they form a chunky paste. (If you want to cheat a little, you can put the beans in a food processor or blender on low speed, so that they mash together but still stay a little chunky). Once the beans are mashed, mince the garlic and add it to the beans along with the oil and salt. Use a hand mixer to beat and mix the ingredients together; the oil will help to smooth out the bean paste and give it a creamy texture. 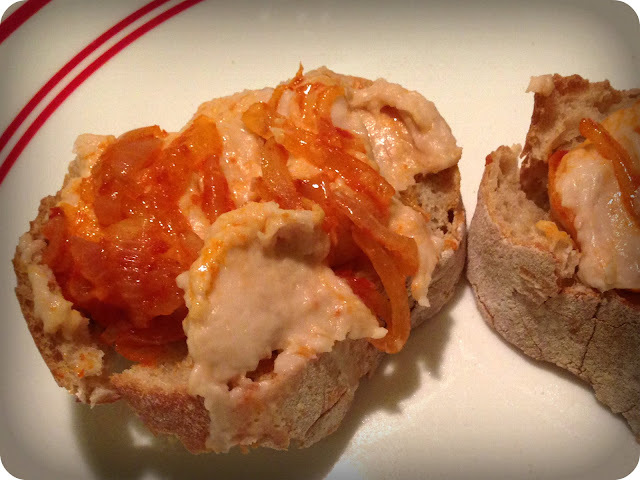 Transfer the dip to a serving dish or Tupperware, then spread the caramelized onion topping over the surface. 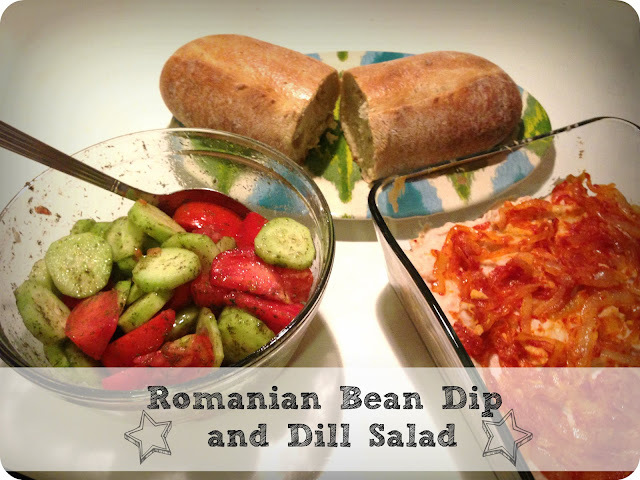 Have I mentioned that Romanians also LOVE dill? You’ll find this unassuming spice, dried or fresh, in many classic Romanian dishes. For an easy, refreshing side, try this. Peel cucumbers and slice. Rinse tomatoes and slice. Mix cucumbers, tomatoes, oil, vinegar, dill, and salt in a bowl and toss.